The X-wing fighter pilots have earned their reputation as the Rebel Alliance's ultimate strike force by overwhelming enemies with their rapid-fire assaults. But now they are about to embark on a diplomatic mission that will prove to be even more hazardous than all-out combat....STARFIGHTERS OF ADUMARThe neutral world of Adumar has decided to pick a side in the war to control the galaxy. Delegates from both the New Republic and the Empire have been invited to Adumar, and each camp will be given a chance to plead its government's case. But there is one small catch: since the Adumari prize military skill above all else, they insist that both delegations be composed exclusively of fighter pilots. For pilot Wedge Antilles and his company, it's an unfamiliar exercise in diplomacy -- and one that's filled with unexpected peril. 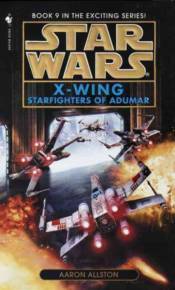 For once they arrive, the X-wing pilots are challenged by Adumar's fierce warriors and attacked by Imperial assassins bent on eliminating all competition. But these challenges pale in comparison to the threat posed by a rogue Republic agent... one who is determined to win Adumar's allegiance once and for all -- even if it costs the X-wing pilots their lives.